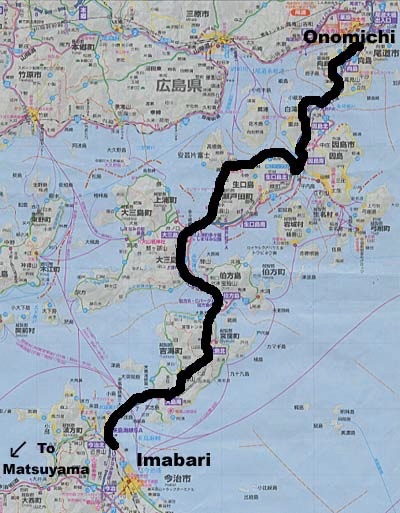 Considering the fact that this route crosses several large islands on its way between Honshu and Shikoku, it's surprisingly level; virtually the only elevations of any kind are the entrances and exits to and from the bridges (which can be quite high in elevation, as the photos should show). For this reason, any cyclist in reasonable condition should be able to complete the 77 kilometer ride in a single day, even without a lot of cycling experience. (There are places to stay along the route if you want to take it slower, and an overnighter might enhance your enjoyment of the trip.) Most people will only run into time constraints if they enjoy the route as much as I did and therefore kick back the pace to enjoy it... or if they stop to take as many photos as I did. If you're cycling from Shikoku to Honshu, you will be ending right at Onomichi, a fair-sized tourist destination with several minshuku and many other accommodations. However, note that if you are going in the other direction and ending up in Shikoku, you have a ride of several kilometers into central Imabari from the bridge or an even longer ride of some 40 km to Matsuyama. It is also possible to rent a bicycle at one end and then drop it off at the other end and bus back (or onward); for more information on this option, see the Nuts & Bolts section. Both directions have their advantages; for purposes of logistics, we assume you're coming from Honshu and going to Shikoku. This direction is advantageous in that the last bridge is arguably the most spectacular. However, riding from Shikoku to Honshu allows you to end up in Onomichi, which is a great place to kick back for a day or so after a great ride. If I had to choose, I might spend a leisurely day in Onomichi, get a good night's sleep and then get an early start on the ride.